Librarians are, by our very nature, selfless creatures. We think about our users constantly, in just about every area of our work. 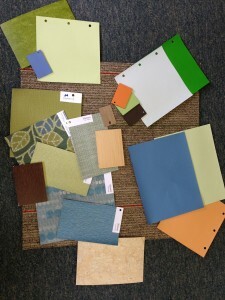 From collection development to research instruction, web design to furniture and paint colors. But do we really know them and understand the full spectrum of their needs? 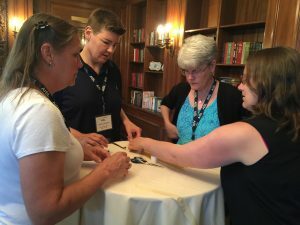 Enter Design Thinking @ Your Library, the 2016 AISL Summer Institute. This June, 36 librarians came together from the four corners of the United States, representing Lower, Middle, and Upper Division libraries, all with a single mission: to learn how to “do” Design Thinking and to return to our schools ready to tackle challenges, great and small. I still couldn’t quite wrap my mind around how it would work, from start to finish, in the library world. There, I said it. The Summer Institute changed all of that. We started with an opening cocktail party where we mingled and got to know one another. We enjoyed delicious food and drink but then…it was time to get down to business. We split up into teams for a quick, fun Marshmallow Design Challenge. Many a group has attempted this challenge before, from Kindergartners to PhDs , engineers to corporate executives. Who do you think is the most successful? The engineers? Think again! It’s the little ones! Why? Because they are completely open minded. They jump right in and start building. Adults plan, contemplate the “what ifs”, and basically eat up their 18 minutes. Kids aren’t afraid to fail. They build. It falls down. They try again. If you need a great team building activity for a faculty meeting, this is a great one. The final part of the conference was the one that my colleagues and I were most anxious about. How could we divide such a diverse group into balanced teams, around shared challenges in varied divisions, in a way that made sense and provided them with real, applicable, takeaways from the SI? On the fly, we asked them to take a piece of paper, write their division at the top, their challenge as a headline, and at the bottom, which “track” of the SI their challenge fell under: Research, Physical Space, Maker, or simply “Other”. You know what? IT TOTALLY WORKED. Rather than tell you about their intriguing challenges, their thoughtful “What If…” statements, their design horizons, and their prototypes, why don’t you check it out on your own in this SI Libguide I created? While you’re there, feel free to visit the presentations, see the recommended reading, and download the free DT Toolkit provided by IDEO. How can we ensure that we are creating the spaces, programs, and lessons that our community needs, both now and in the future? We do what we do best: we observe, we question, we listen, we invite other perspectives to the table, we think outside the box, we take risks, we try things! Whether we realize it or not, the skill set emphasized in design thinking is very much what we as librarians do best. SI Participants, feel free to share your reflections below. If anyone has questions or if you would like to discuss the experience further, please let me know! SI2017 will be here before you know it! It will be hosted by Caroline Bartels at the Horace Mann School in NYC focusing on One Book One School. More info to come as planning progresses. I wish you all an excellent start to the ’16-’17 school year! What do YOU think of when you read that word? Me? I get giddy with excitement! 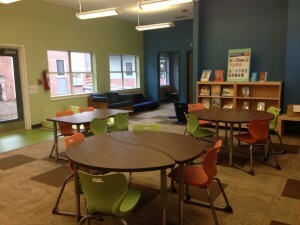 In my first year as the Lower School Librarian at Carolina Friends School, I was given the privilege (and let’s not kid ourselves, the enormous responsibility) of re-designing and re-imagining not only our library space but also our library program. In this post, I’ll share with you a small fraction of my thoughts and considerations in designing the physical space. Our Lower School library serves 120 students, first through fourth years. I started the 2014-15 school year with 8,000 print volumes nestled in this 600 square-foot space. 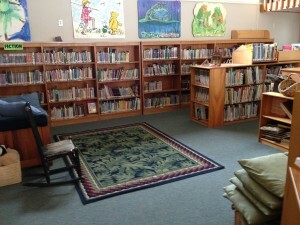 Our storytime area could comfortably seat a handful of students, though I often had 10-12 students at a time. Plans were already in the making before I arrived to increase the library space as a part of a larger Lower School renovation. I was beyond thrilled. After looking at the architect’s drawings, though, I realized that the library would only be gaining a few feet of space. This couldn’t be right! After much research and consideration, I presented my proposal to increase the library space to the entire 1,800 square-foot building to my staff. Yes, the library would be tripling in size, but it would still be well below the state recommendations for an elementary school library (see resources at end). This was not an easy presentation to make, especially since I was brand new and had yet to develop working relationships with any of my teachers. Nonetheless, the proposal was approved! Well, after performing an in-depth collection analysis using TitleWise by Follett, I realized that the collection needed to be weeded immediately. Or rather, 20 years ago. I know that weeding in your first year is highly frowned upon, but my options were limited. I would have to either box up all 8,000 musty books and place them on brand new library shelves, or I would have to confidently cull the collection. I chose to cull. I was conservative in my weeding efforts. Only 2,000 volumes were whisked away to find better homes. 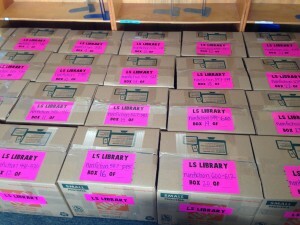 The rest were meticulously boxed up near the end of the school year. I boxed everything in shelf order and labeled and numbered each box so that they could easily be unpacked by volunteers. This is where thinking ahead saved me from a ton of work later in the summer! Emptying this tightly-packed library was no easy feat, but I had loads of help from staff, staff kids, and extra workers we employed for the renovation. Remember, the whole Lower School was packing up, too! The boxes were hauled to a Pack Rat, which was then transported to a climate-controlled warehouse. But I’m getting ahead of myself. Throughout the school year, I was planning and designing and researching library spaces. I knew that we were heading for some BIG changes. I do not exaggerate when I say that all of my “free” time was devoted to designing the new library. I visited other school libraries and took notes on what worked and what didn’t. I read books about 21st century library design. I spoke with experts in the field. I talked to anyone who would listen and provide feedback! A common theme was emerging from my research – the space had to be exactly what it was not in the past. It had to be FLEXIBLE. Bookshelves on wheels. Tables on wheels. Lightweight furniture. Because our needs are many and varied, so our space would need to accommodate them. Can I fit a whole class in the library? A half class? Small groups? Are there quiet reading areas? And loud ones too? Cozy nooks for students to get lost in a book? These considerations and more were on my mind when I met with our furniture and design consultants to select shelving units, tables, chairs, lounge pieces, wall colors, furniture fabrics, tabletop finishes, carpet designs, and more. So, when I say that I re-designed our library, I mean it! I selected every new piece, every new color and textile. This is not something that everyone will feel comfortable doing, but I think I must have been an interior designer in a former life. I had my say in every last detail. Once all of the hard work of planning for this renovation had been done, it was time to renovate! Luckily, I could now sit back and enjoy my summer. When I returned in August 2015, the library was nearly transformed! Okay, nearly might not be the right word. If you’ve ever lived through a renovation, personal or school, you know that timelines are not always, or ever, accurate. We started the school year with most of our spaces ready enough for students. It’s now November, and the library is almost finished. I still have furniture on back order. And of course, there’s the work of adding artwork and bulletin boards and signage. That will be ongoing throughout this school year. But the end result? It’s simply breathtaking. The comment I hear most often is, “It looks like a real library!” Well, thank you. We have moved from the one-room “library” to a true learning commons. Bitterman, A., Gray, L., and Goldring, R. (2013). Characteristics of Public Elementary and Secondary School Library Media Centers in the United States: Results From the 2011–12 Schools and Staffing Survey (NCES 2013–315). U.S. Department of Education. Washington, DC: National Center for Education Statistics. Retrieved 21 Aug. 2014 from http://nces.ed.gov/pubsearch. “Educational Specifications for the School Library Media Center.” IMPACT: Guidelines for North Carolina Media and Technology Programs ~Information Access and Delivery. NC DPI, 2006. Web. 21 Aug. 2014. <http://www.ncwiseowl.org/impact/info.htm#LMCspecs>. Erikson, Rolf, and Carolyn Bussian. Markuson. Designing a School Library Media Center for the Future. 2nd ed. Chicago: American Library Association, 2007. Hart, Thomas L. The School Library Media Facilities Planner. New York: Neal-Schuman, 2006. Harvey, Carl A. The 21st Century Elementary Library Media Program. Santa Barbara, CA: Linworth Pub., 2010. PowerPoint presentation from Designing School Libraries for 21st Century Learners by Peg Sullivan, Standards and Guidelines Implementation Task Force Member, at AASL National Conference in Charlotte, NC. Sullivan, Margaret. Library Spaces for 21st-century Learners: A Planning Guide for Creating New School Library Concepts. Chicago, IL: American Association of School Librarians, 2013.